Sen. Jeff Sessions (R-Ala.) (R) speaks while Sen. John Cornyn (R-Texas) listens, during a Senate Judiciary Committee hearing on immigration reform on April 22, 2013 in Washington, D.C. If you've been paying attention to the immigration debate in Congress, then you've probably noticed Jeff Sessions. It would be hard to find a more persistent and vocal foe of the bipartisan Senate immigration bill than the Alabama Republican. But so far, Sessions has appeared to be more of a lone wolf rather than a man who's on the cusp of rallying a large coalition to stymie the plan. Sessions offered 15 amendments to the bill last month, the most of which would have gutted its core proposals. (Only one of Sessions' minor amendments was adopted without being changed). Several times a day his office also circulated materials from law enforcement groups like the ICE union and conservative pundits like Michelle Malkin and Erick Erickson blasting the plan. Sessions himself railed (and railed, and railed...) against the proposal during committee hearings, claiming it would hurt American workers and violate the rule of law. Once the bill moves to the Senate floor in the next two weeks, Sessions will certainly amplify his efforts to defeat it, and key anti-immigration reform foes are betting on him winning the debate. 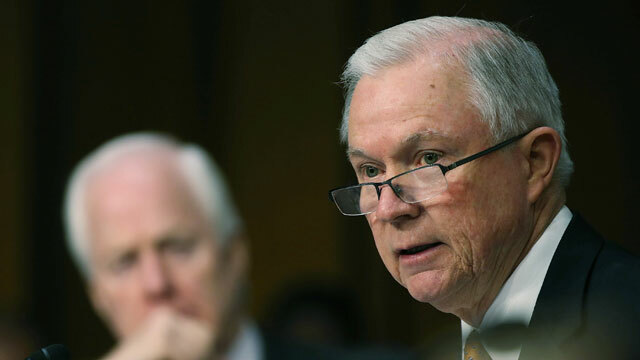 "While many people oppose things like this, there aren't many people who take the lead," said Roy Beck, executive director of the anti-immigration group NumbersUSA, which works closely with Sessions. "He is the chief spokesman … his success will be killing the bill on the floor." But so far, Sessions has not been able to slow down or scuttle the bill. The Senate Judiciary Committee passed the proposal on a bipartisan 13-5 vote. If his continued effort does manage to do some serious damage, Sessions would repeat the success he had in 2007 when he helped lead a conservative revolt against a similar immigration reform bill. But that's going to be much harder for a slew of reasons. Broadly, in the past year, the politics of immigration has shifted favorably towards those who support it. So much so that even pro-reform Republicans have proven to be more organized in defending the proposal both on and off Capitol Hill than they were six years ago. Mark Krikorian, executive director of the Center for Immigration Studies, which wants to reduce immigration levels, believes the bill can still be defeated, but acknowledges that his side is facing a more formidable opposition. "[Sessions is] doing it in the face of a much better prepared and lavishly-funded pro-amnesty coalition," he said. Beyond a better game plan by pro-reform groups, the anti-reform coalition in the Senate also suffered a major loss when Jim DeMint decamped to lead the conservative Heritage Foundation last December. Yes, freshmen like Ted Cruz have stepped in and veterans like Chuck Grassley are still around. But pro-immigration leaders say it will be tough for Sessions to fill DeMint's shoes. "When DeMint announced that he was leaving the Senate, we were very happy, because he's actually a more formidable [and] savvy politician than Jeff Sessions," said Frank Sharry, executive director of the pro-immigration reform group America's Voice. "We're blessed by the fact that [Sessions] is the leading opponent because he doesn't bring a lot of gravitas or allies with him." So, given how daunting the task, why is Sessions so passionate about defeating immigration reform even as his own party's leadership is warming to it? To hear the senator and his allies tell it, Sessions is solely motivated by policy concerns. As a former U.S. attorney, he believes that allowing people who crossed the border illegally or overstayed their visas will spark future illegal immigration. And he preaches that allowing large numbers of immigrant workers into the U.S. will depress the wage levels of American-born workers. "I believe this bill allows more people into the country than we can absorb economically," Sessions told ABC News. "I believe this bill does not increase lawfulness in the system in the degree that needs to be done." But his opponents detect more sinister motives. To undermine his arguments, they point to studies that show that liberalizing immigration laws could boost the nation's GDP while having a negligible impact on the labor market for native-born Americans. Instead, they accuse Sessions of stretching the facts to play to the fears of poor and lower-middle class voters in Alabama who worry that a wave of immigrants could hurt them economically. "He is playing to a segment of Alabama society that is scared," said Helen Hamilton Rivas, an immigrant-rights advocate who has lived in Alabama since 1980. "Fear drives a lot of the anti-immigrant stuff. Fear and ignorance." Immigration-reform proponents seem to think that fear can be a powerful motivator. Six in ten Republicans nationally oppose a pathway to citizenship, according to an April ABC News/Washington Post poll. So even though a full-on revolt on the right hasn't exactly materialized, such numbers suggest it could. That could be why pro-reform forces are doing everything they can to marginalize Sessions and portray him as an isolated and out-of-touch xenophobe who is bigoted toward racial and ethnic minorities. It's why Sessions' failed 1986 bid to be confirmed as a federal judge has been dredged up. His confirmation was sunk after African-American colleagues accused him of racial insensitivity. Thomas Figures, a former assistant U.S. attorney, even alleged at the time that Sessions called him "boy" and said that he thought members of the Ku Klux Klan "were okay until I learned they smoked pot." Sessions denied the allegations of racial bigotry in testimony at the time. Reform supporters have also hit Sessions for supporting an Arizona-style immigration law, which passed in Alabama in 2011. Immigrant-rights activists said the law legally sanctioned racial profiling and a federal judge struck down many of its provisions as unconstitutional. Immigrant advocates like Sharry also like to refer to the Alabamian by his full name -- Jefferson Beauregard Sessions III -- to conjure up an image of a Confederate general leading the charge. Of course, Sessions vehemently denies that he holds racist or xenophobic views or that any such views inform his opinions on immigration. "I don't appreciate it if someone says that, 'you are not kind and you're mean-spirited and you don't like immigrants.' Because I do favor immigration," he said. "We've got to ask some fundamental questions. A lot of people are concerned about this. And I intend to make sure that as best I can that these issues are debated openly." Regardless of his motives, the question for Sessions is whether he has the political moxie to reverse the tide on the Senate's reform bill. "We have a long way to go and it's going to be hard," Sharry says. "Sessions and the anti-immigrant groups, they've got some public support for their position even if it's a minority view. But so far they have underperformed." Correction, 10:49 AM: This piece has been updated to accurately reflect the number of amendments Sesisons offered to the bill in committee hearings. The senator proposed 49 total, but only offered 15 of those for a vote. +Jeff Sessions Stands Alone on Imm.